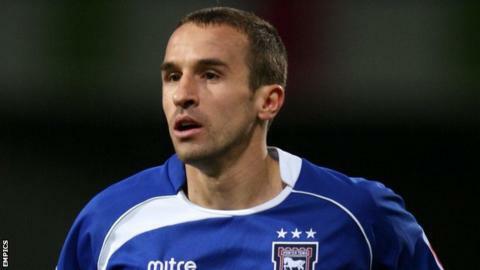 Retired former Colchester United and Ipswich defender David Wright says he hopes to manage some day. The 34-year-old ended his playing career by leaving the U's last week, but will continue his work as a youth coach at Town. "I think management is the target at the end of the line. But that's many, many years in the future," he told BBC Radio Suffolk. Wright made his first appearance in 1997 and played 538 games. He started his career at Crewe before spells at Wigan, Norwich, Ipswich, Crystal Palace, Gillingham and Colchester. "I was lucky enough to play many games and I felt I built a reputation," said Wright, who played in central midfield later in his career. "But as a coach it's like your youth training scheme again. You've got no reputation and nobody knows who you are. "Many years down the line if the opportunity to manage comes around I'm sure I will take it." Warrington-born Wright featured 128 times for Ipswich, but remained in Suffolk after his release in 2010. "I was really upset. I didn't want to go. It's the best club I've played for," he said. "But my family moved to Ipswich and we settled there, that's how much we loved the town. I can't see us living anywhere else other than Ipswich."